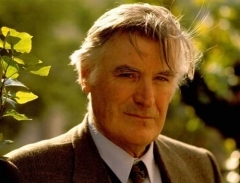 The Elmet Trust celebrates the life and works of Ted Hughes, OM, poet and children’s author, who is rated as one of the country’s greatest writers. Hughes served as poet laureate from 1984 until his death in 1998. Based in the poet’s birthplace, Mytholmroyd, in Yorkshire’s Upper Calder Valley, the main aim of the Elmet Trust is to foster serious interest in the life and works of Ted Hughes, and to look after his birthplace, 1 Aspinall Street, Mytholmroyd. Hughes lived in Aspinall Street until the age of seven, and many of his poems draw on his lifelong love of the Valley’s people and its landscapes. The Elmet Trust rents out Ted’s House as a holiday let and/or writer’s retreat, and runs a programme of Hughes related events throughout the year. The Elmet Trust has strong links with the communities of the Upper Valley and works closely with Calderdale Council, the Hughes’ Estate, the Ted Hughes Society, and the Ted Hughes Project South Yorkshire. Our patron is Simon Armitage CBE, Oxford Professor of Poetry. Why not join us and help to promote interest in Hughes's work?